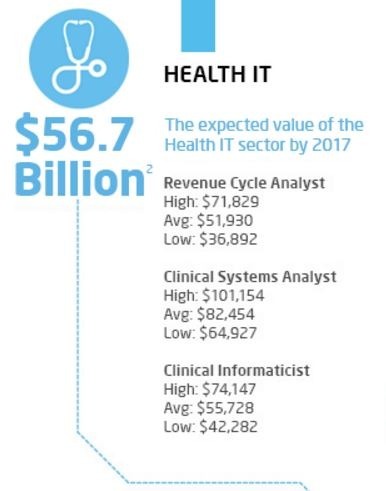 Healthcare IT (HCIT) is poised to be one of the fastest growing areas within the healthcare industry through 2020. Conversely, a lot is being invested in key areas within the healthcare technology space, namely, coding standardizations, population health management, and patient engagement programs. With medical coding standardization, the outdated ICD-9 is phasing out to make room for the updated and expanded ICD-10. The transition deadline was on October 1st of this year (2015). While most hospital and health systems are already using components of the new record system, full implementation is a process that will be a major concentration for more than half of all hospitals over the next few years. With this, comes a need for implementation specialists, tech-savvy coders, DBA’s, and migration/integration specialists. Population health management will also be at the forefront of medical centers, especially larger hospital systems (251+ beds). Behind this movement lies the goal of merging healthcare data analytics with clinical patient care. This requires new training and investment initiatives that will bring HCIT and clinicians closer together, with clinical and biological informaticists, lab technologists and technicians working with an increasingly tech savvy clinicians and patient-facing health care workers. Lastly, an even more nascent area, Patient Engagement, is fast becoming a focus of executive hospital leadership. And again, Health care IT plays an integral part in the implementation of these programs. Only 60% of all hospitals surveyed have any sort of patient engagement program. This is perhaps one of the more difficult programs to implement, as it involves a lot of buy-in, and cultural changes within the hospital. More than just shooting text message reminders of upcoming appointments, successful programs are providing “actionable information to patients, prompting them to take action and then measuring the impact is has” (Source). Signs of a successful program uses accessible technology (apps, aggregate SMS, connected integration) to provide this information on their terms, and measures the impact of such actionable info to use to continuously improve individual treatment plans, as well as processes associated with these courses of action.